Right about now, people are dying to know when the first cherry cultivars will blossom in the Japanese Hill-and-Pond Garden and when Cherry Esplanade will be at peak bloom. Is there any way to know in advance? Can data from past bloom times and weather conditions help predict when cherry cultivars—or any other flowering plant—will blossom? Well, yes, up to a point. The study of how plant and animal life cycles are influenced by the environment is called phenology. Phenological data is often used to study ecosystem health as well as valuable agricultural crops—for instance, vineyards rely on phenology to predict grape quality and yields. Farmers also use phenology to try to predict and prepare for pest infestations. After years of carefully tracking data on the timing of plant and animal life cycles, as well as temperatures and precipitation, they can anticipate how the coming year will unfold. When it comes to spring bloom times, the best predictor is a measure called growing degree days—the number of days above a particular temperature, says Melanie Sifton, vice-president of horticulture at BBG. So unfortunately, any predictions are limited by how accurately we can predict the weather in advance. “As much as we’d all like to, there’s no way you can tell in, say, February when the Kanzan cherries will bloom because you don’t know what the temperatures will be for the next few months,” says Sifton. But there are a few phenological rules of thumb that can give everyone some idea of how spring flowers will behave. A good stretch of warm weather will trigger the cherries and other spring-blooming plants to flower. 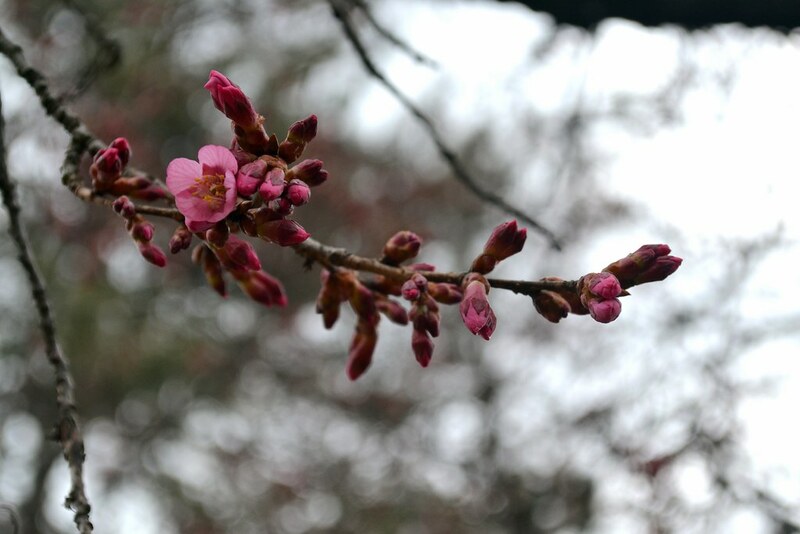 “When it’s above 60 degrees or so for several days in a row, you’ll see the buds of the early-blooming cherries like Prunus ‘Okame’ start to swell. Around this same time, you’ll also see the bud scales from the magnolias start to drop,” says Brian Funk, curator of the Japanese Hill-and-Pond Garden. For flowers, temperature matters much more than sunlight or precipitation. Again, it’s the growing degree days that really triggers blooming. Flowers will respond to warm cloudy days more than cool sunny days. Rain doesn’t have much of an immediate effect, except that a hard rain can sometimes batter open blossoms and shorten the bloom period. The sequence of the bloom times is usually fairly consistent. In other words, the early-bloomers will still bloom before the late bloomers, though there might be slight variation. Once the flowers are in bloom, some chilly weather might help preserve them. Cool weather extends bloom time. “Think about it—that’s why they keep cut flowers in a cooler,” says Sifton. A warm spell, say a few days of near-80-degree weather, on the other hand, will shorten bloom periods and flowers will wither and drop off quickly. So if you’re eager for the cherries to blossom, watch the weather forecast, visit the Garden often, and hope for a stretch of warmth to trigger blooms, followed by a nice, dry chill to keep them fresh. And be sure to check CherryWatch for regular updates. Do you know when the cherries will blossom? Thank you. Can you predict if the trees will blossom before the Japanese festival or will it be perfect timing? Great blog post. Thanks for writing. Prunus 'Okame' is one of the early-blooming cherries. It's often in bloom in early April, but this year's chilly spring has delayed bloom times by several weeks. Photo by Elizabeth Peters.